Cash for high-tech trash. That’s the basic concept for the recycling kiosk from ecoATM. You drop off old electronics at one of these machines, it calculates their value, then pays you on the spot, in cash or coupons. Think it’ll work? Apparently some venture capitalists do, because ecoATM announced Wednesday its first round of venture funding, led by Tao Venture partners. ecoATM’s secret sauce is its kiosks’ ability to automatically estimate — using electronic and visual techniques — a price of the unwanted items that will give consumers an “immediate financial incentive” to recycle at the station, Mark Bowles, ecoATM’s chief marketing officer, told us today. The company has built a network of 50 buyers around the globe that will take used consumer electronics devices that ecoATM collects from its kiosks (currently just mobile phones but soon expanding to iPods, MP3 players and game cartridges) and recycle the components. ecoATM finds the best price for the devices and then passes a portion of that revenue onto its customers. So far the company has placed five kiosks, and it aims to deploy 200 across the U.S. by the end of the year, mostly in electronics retailers. Typically, customers receive coupons for buying products in the store where the kiosk resides, and ecoATM then reimburses the store for the value of the exchange. But the coupon model encourages more spending, which contributes to more waste. That might be part of the reason Bowles said ecoATM is also experimenting with paying customers in cash. 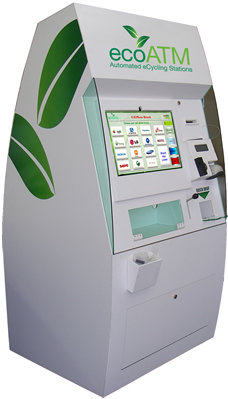 ecoATM has certainly hit upon a market ripe for innovation. The EPA says that in 2005 the U.S. generated 2 million tons of e-waste and only about 350,000 tons of it was recycled. The remaining bulk ends up in landfills. All that valuable waste has led to a flurry of activity in the recycling market, much of it so far revolving around web sites like SecondRotation that help consumers find homes for their used goods (here’s a list of five such sites). In another example, Kleiner Perkins-backed RecycleBank partners with cities to provide incentives for residential recycling. But Bowles says the web site-as-recycling-center model doesn’t work. Most people don’t want to go through the hassle of labeling and shipping their used items and finding prospective buyers. ecoATM, he says, is all about convenience. I would be concerned that this might be an easy way for thiefs to cash in on electronics that they snag. This could also mean that people could get their property back, but it could encourage an increase in thefts if the cash incentive is higher than reselling electronics on a black market.